This fall, Laughing Stock Vineyards three wines. Two are superb and one left me confounded. First, the two I found superb. Portfolio is the winery’s iconic red. I am fortunate to have a few 10-year verticals in my cellar. The wine no longer is easy to get, unless you join the wine club. The individual on whose orders I was piggybacking let his membership lapse this year, sadly for me. The superb white is a barrel-fermented Chardonnay. It will also be hard to get because only 317 cases were produced. The wine that I have trouble with is a Syrah that was fermented in a clay amphora. 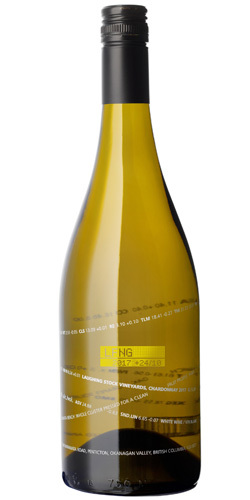 I have no doubt this wine will sell out, if it is not already sold out, to those consumers who like “natural” wines. Every wine has its champion. Let me quote the winery’s notes on how winemaker David Enns made this wine. “This small cap release is a tribute to how wine was made in ancient times,” the note begins. “Using a hands-off winemaking approach, this is our fifth year of working with two 500 litre terracotta clay Amphorae. The result is a wine that challenges you to define it to a specific region or style. In previous vintages, David made Viognier Roussanne wine in the Amphorae. He switched to Syrah in 2016 and again in 2017 and extended the time in clay from five months to eight months. At that point, the wine is pressed off with a basket press and bottled. My palate prefers conventionally-made Syrah. However, this bottle will create a sensation and likely controversy at your dinner table. 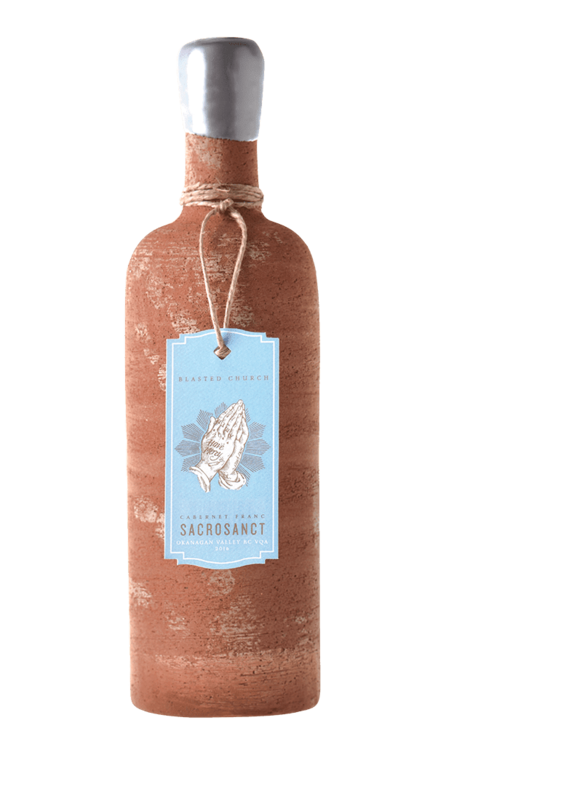 Laughing Stock was acquired in 2017 by Arterra Wines, the national producer owned by the Ontario Teachers Pension Plan. 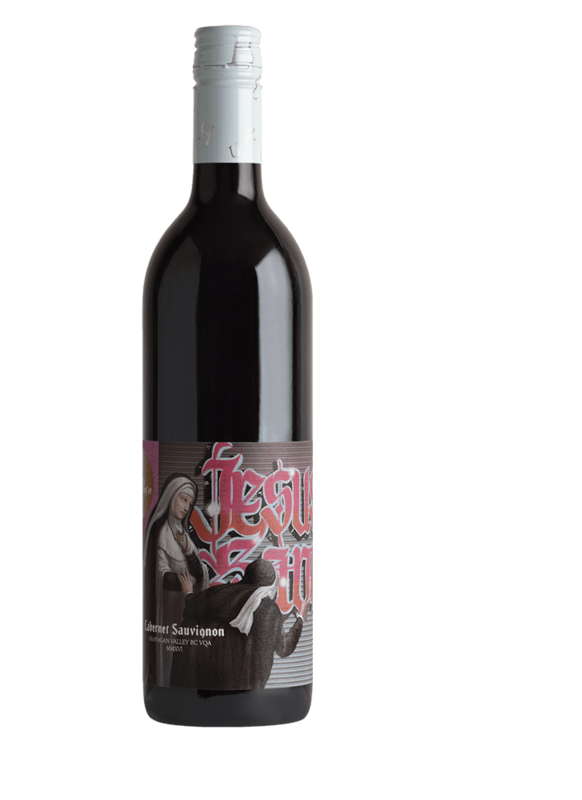 To the best of my knowledge, none of the other Arterra wineries in the Okanagan produce anything quite this edgy. Laughing Stock Chardonnay 2017 ($28.99 for 312 cases). This was fermented in oak barrels (15% new) but the oak is subtle and well integrated. The wine begins with aromas citrus and brioche leading to flavours of apple and pear. The wine is fresh and elegant with a lingering finish. 92. Laughing Stock Portfolio 2016 ($49.99 for 3,300 cases). This is a blend of 51% Merlot, 24% Cabernet Sauvignon, 20% Cabernet Franc, 4% Malbec and 1% Petit Verdot. The wine announces itself with powerful aromas of black cherry, plum, spice and vanilla. On the palate, layers of dark fruit fill the mouth. The long, ripe tannins give the wine a polished texture, with ability to age 10 or more years. 94. Laughing Stock Amphora Syrah 2017 ($49.99 for 100 cases). First, here is the winery’s description: “This beautiful deep blue-violet coloured wine has vibrant aromas of anise and ripe mixed berries. The palate is silky with raspberries baking spices, and warm mocha.” I thought the wine also had aromas and flavours of chocolate, plum and fig with a hint of licorice on the finish as well as an earthy note. On re-tasting the opened wine over several days, I found that intense sweet fruit flavours also developed. Clearly, the wine needs to be decanted. I won’t even try to score this wine. I did not like it on first opening but I did like it by the fifth day. As for food pairing, the wine’s robust flavours call for game meats. 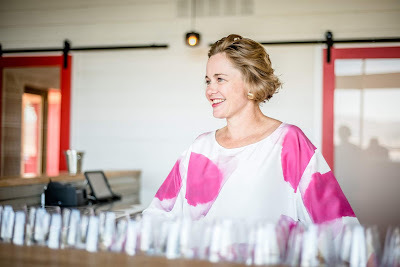 Heidi Noble, the proprietor at JoieFarm Winery, says her winemaking was re-invigorated this fall by here experience this summer, working with the winery’s two in-house chefs. JoieFarm took its food service up a notch or more when Heidi, a trained chef herself, took her turn in the kitchen with chefs Brian Skinner and Lina Cascheto. The service was called Le Comptoir at Joie Picnique, a step beyond the excellent wood-fired pizzas the winery has had for several years. For Heidi, the experience illuminated how her wines could be paired with various menus. And she encourages consumers to recreate Old World recipes and pair them with her European-inspired wines. The JoieFarm wines, in fact, have always been food friendly wines, with just the right structure and acidity to flatter whatever is on the plate. This is especially so with the exceptional “En Famille” reserve tier. Here are notes on current releases. All are from the 2016 vintage, one of the best in the last two decades. 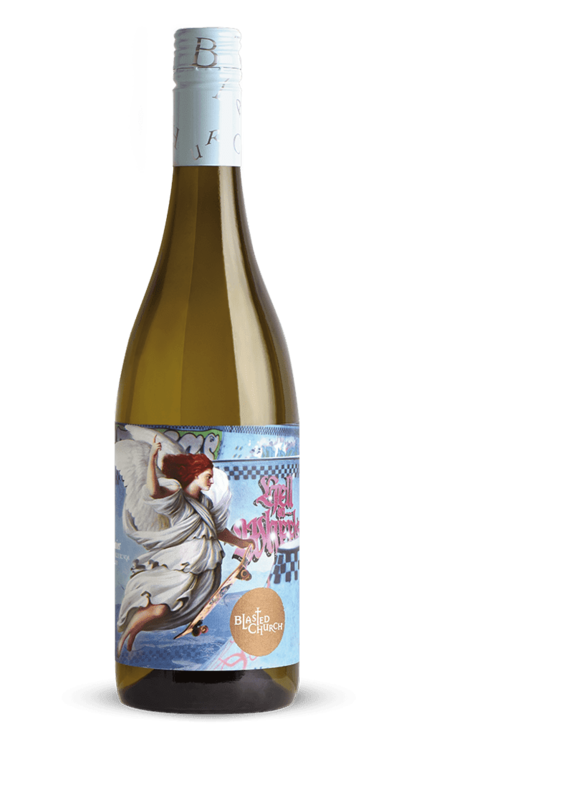 JoieFarm “En Famille” Reserve Riesling 2016 ($27.90 for 381 cases). This wine could also be called “Old Vines) because the grapes are from the 1978 planting at what is now St. Hubertus Vineyards. The richness of old vines is immediately apparent on the nose, where notes of petrol mingle with lemon. On the palate, there are flavours of lemon, lime and ginger framed with honeyed notes. The residual sugar is 17 grams but is nicely balanced with acidity. The mouth-filling flavours persist on the very long finish. 92. 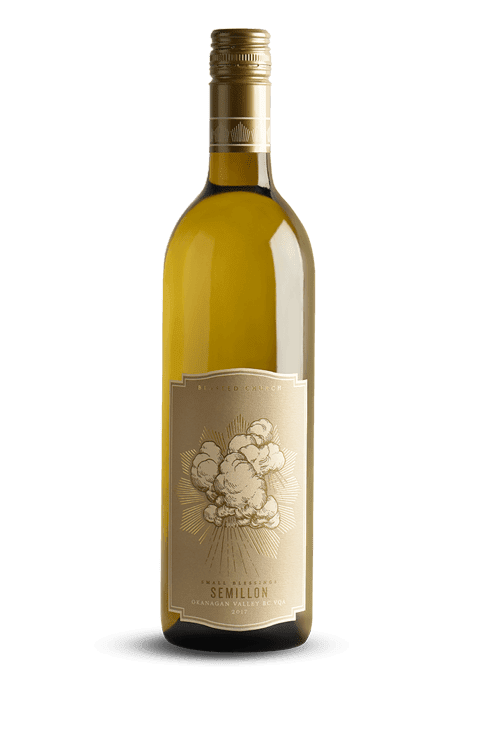 JoieFarm “En Famille” Reserve Chardonnay 2016 ($35 for 279 cases). This wine is made entirely with Chardonnay Musqué, a spicy clone. The wine presents in the glass with a light gold hue. The barrel-fermented wine was aged 10 months in oak, with regular lees stirring. The texture fills the mouth. It has aromas of melon, peach, with an herbal note that Heidi – who is a chef – calls drawn butter. The flavours are complex – baked apple, buttery but also briny. 92. JoieFarm “En Famille” Reserve Gewürztraminer 2016 ($27.90 for 404 cases). The wine begins with aromas of rose petal spice and lychee. On the palate, the wine has a rich, oily texture and flavours of ripe apple and quince. On the finish, there is a hint of ginger and very slight alcoholic warmth, as you might experience with a top notch Alsace Gewürztraminer. 91. JoieFarm Gamay 2016 ($19.50 for 615 cases). Dark in hue, the wine begins with aromas of black cherry and a hint of toast (the wine was aged 10 months in oak – some new barriques, first-fill puncheons and a large neutral oak cask). On the palate, the cherry and blackberry flavours are savoury. Silky tannins lead to a fresh, juicy finish. 91. JoieFarm PTG 2016 ($25.90 for 714 cases). This is 60% Pinot Noir and 40% Gamay Noir, a blend inspired by Burgundy. The wine was aged 10 months in a combination of new and neutral oak. The wine begins with aromas of cherry and spice. That carries through to the flavours, along with plum. The wine has savoury, earthy notes on the finish. 91. JoieFarm Pinot Noir 2016 ($26 for 670 cases). Rich in colour, the wine begins with aromas of cherry and tar. On the palate, there are flavours of cherry and raspberry, with savoury notes mingling oak and fruit on the finish. 90. 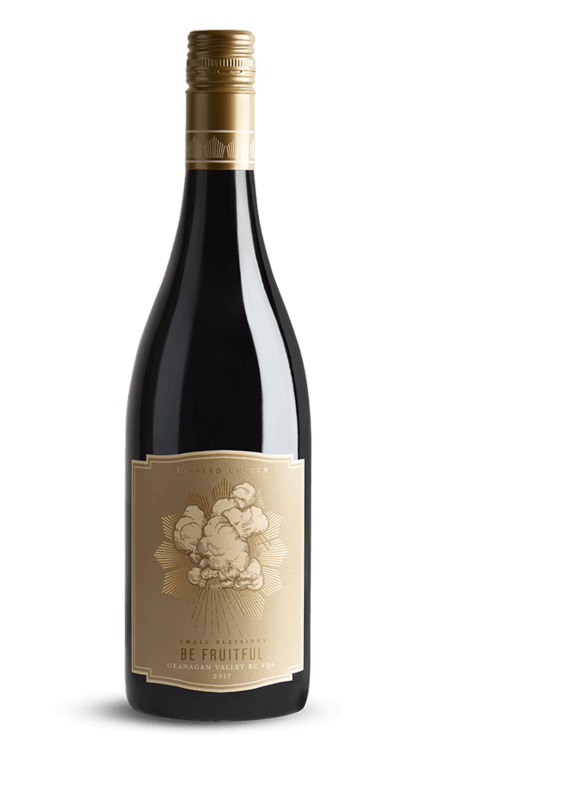 JoieFarm “En Famille” Reserve Pinot Noir 2016 ($40 for 474 cases). 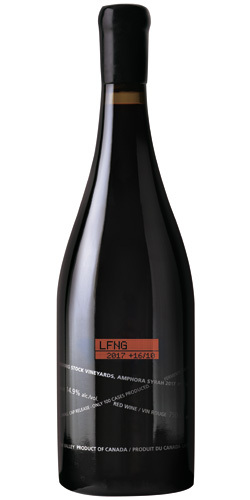 Dark in colour, with intense aromas where cherry mingles with vanilla and chocolate, this is a powerful Pinot Noir. It has flavours of raspberry and cherry with hints of chocolate and coffee. The complexity of this age-worthy wine starts with the use of four clones. The wine was aged eight months on oak (40% new, 60% neutral). 93. Within weeks of buying a Kaleden vineyard for his Black Market Wine Co., Rob Hammersley had a sign at the gate, 198 Spruce Avenue, announcing a planned 2019 opening. It is a sign of how anxious he and Michelle Shewchuk, his partner, are to graduate from virtual winery status to a land-based winery. Black Market has made its wines since 2012 at BC Wine Studio, a custom crush facility at Okanagan Falls. It was a way for getting into wine production without committing too much capital. When Black Market had established its brand, the owners, who had been looking for vineyard property almost two years, were ready for the next step. Kaleden was high on their list of locations. They have named the property Conviction Ridge Vineyard. “We finally have the conviction to do this,” Rob says. Currently residents of Calgary, Rob and Michelle are making plans to move to the Okanagan next year. Now that they have to farm a 4½ acre vineyard, commuting from Calgary no longer will be an option. Michelle is an Air Canada airline flight attendant (and will continue with her career) while Rob, an accountant and business evaluator, expects to become a fulltime grape grower and vintner next year. They have wanted their own winery for some time. Rob’s judgment as a business evaluator guided the hard-headed decision to start with Black Market under the tutelage of BC Wine Studio before risking capital on land and buildings. “From my perspective, the best way to manage the risk of moving into a fairly crowded [wine] market is to get the market space first and work backwards,” Rob explains. The retired owner of what is now Conviction Ridge Vineyard was a long-time grower for Gray Monk, (as are numerous other Kaleden vineyard owners). The vineyard was planted about 35 years ago, initially entirely with Bacchus. About 20 years ago, half was grafted to Merlot. A small block of Pinot Blanc and Pinot Gris is about five years old. Rob had never before made wine with Bacchus but, after picking the brains of other Bacchus producers, quickly figured out how to fold the varietal into his portfolio. An early pick is destined for a traditional method sparkling wine. 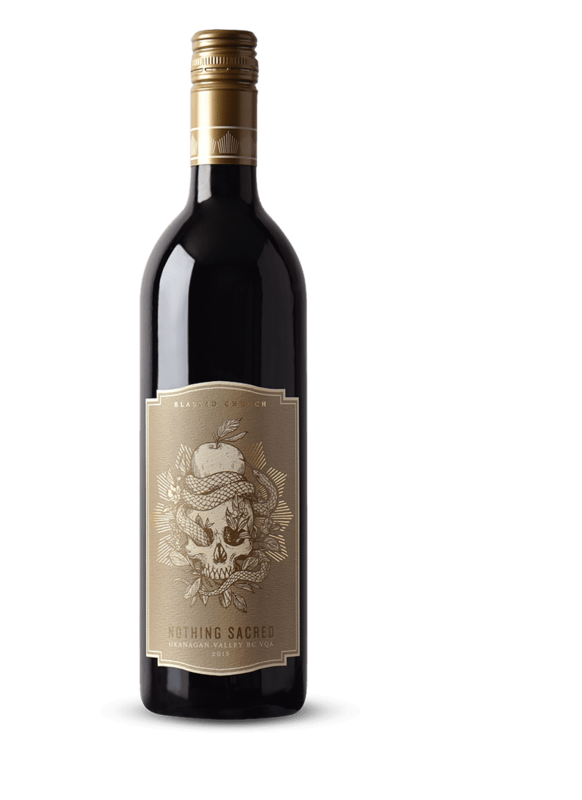 Most of the rest – he did sell some fruit – is likely to be added to Black Market’s top-selling white blend, Secret Society. Because he did not take over Conviction Ridge until August, Rob had not time to convert one of the buildings on the property for wine processing. He made the 2018 vintage at BC Wine Studio. By securing a license for Black Market’s winery and tasting room, Rob expects to achieve a significant improvement in his winery’s economics. He will continue to purchase grapes, since Conviction Ridge does not grow most of the varietals Black Market has in its portfolio. For example, the vineyard’s Merlot is only one of the varietals required for The Syndicate, the winery’s Bordeaux red blend. Similarly, he needs to buy Sémillon and Sauvignon Blanc for Collusion, the winery’s white Bordeaux blend. “As far as reds go, Syrah is where my passion lies,” Rob says. During his enology course, he did a research paper comparing growing conditions of Côte Roti in the Rhône with the Okanagan. He concluded that the wide temperature range between the Okanagan’s hot days and cool nights help make Okanagan Syrah distinctive. Black Market’s portfolio is tightly focussed. Rob is tempted to add a Gewürztraminer because he has a good source of fruit. And when he finds an exceptional barrel or two in a vintage, he produces small lots which are offered first to Black Market’s wine club. Current examples are a 2017 Sémillon (100 cases only) and a 2016 Cabernet Sauvignon (not yet released). Here are notes on Black Market’s wines. The wines are available on line. As well, the winery's website lists the numerous wine stores and restaurants that carry Black Market. Black Market Sémillon 2017 ($26). Barrel-fermented in neutral oak, this is a concentrated dry white with aromas and flavours of citrus and a backbone of minerality. 90. Black Market Collusion 2017 ($24). This is typically a blend of 75% Sauvignon Blanc and 25% Sémillon. Aged in barrels for five months, it is a crisp wine with aromas of lime and lemon. That is echoed on the palate, along with herbal notes that give the wine great complexity. 91. Black Market Secret Society 2017 ($22). The blend has varied over the vintages but the profile has been similar: a dry white aromatic wine. This vintage is about 60% Gewürztraminer, with Muscat and Sauvignon Blanc. It begins with aromas of rose petals and spice. It is juicy on the palate with tropical fruit flavours. 90. Black Market Syrah 2016 ($35). This begins with aromas of black cherry. On the palate, the deli meat flavours mingle with black cherry and pepper. The firm texture indicates that this wine should be cellared a few more years. 90-92. Black Market The Syndicate 2015 ($30). 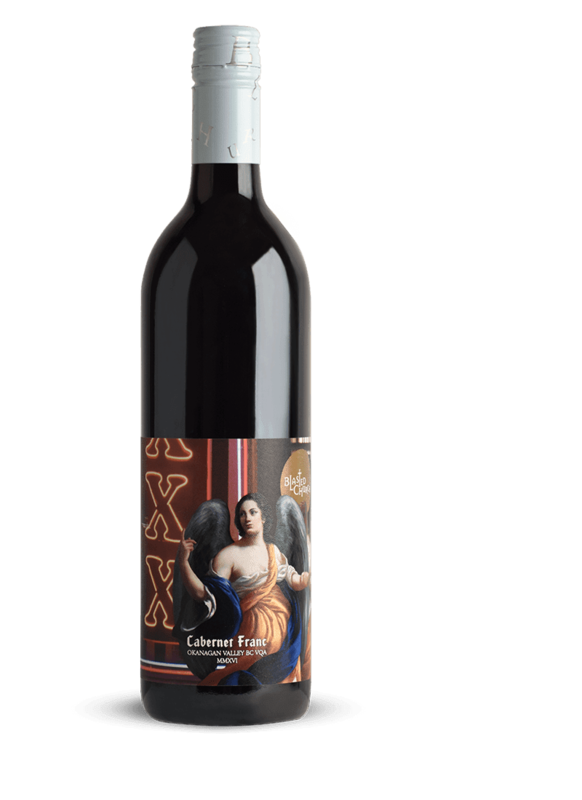 The blend is 31% Merlot, 29% Cabernet Franc, 24% Cabernet Sauvignon and 16% Petit Verdot. Perhaps the latter varietal defines this wine, give it a dark colour, a dense texture and a floral aroma. There is also a note of cassis and black cherry on the nose. On the palate, the black currant and cherry flavours mingle with fig, spice and vanilla. 91. Black Market The Syndicate 2016 (tank sample). This is a blend of 50% Merlot, 40% Cabernet Franc and 10% Petit Verdot. This wine has the plumpness of ripe Merlot and the brambly aromas and flavours of Cabernet Franc. There are also flavours of cherry and blueberry with a touch of mocha on the finish. It is different from the previous vintage but is equally interesting. 91. 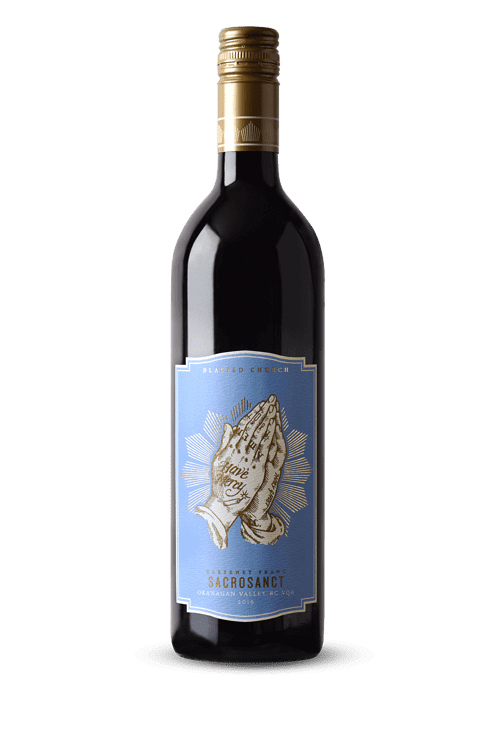 Black Market Cabernet Sauvignon 2016 (Est. $40). 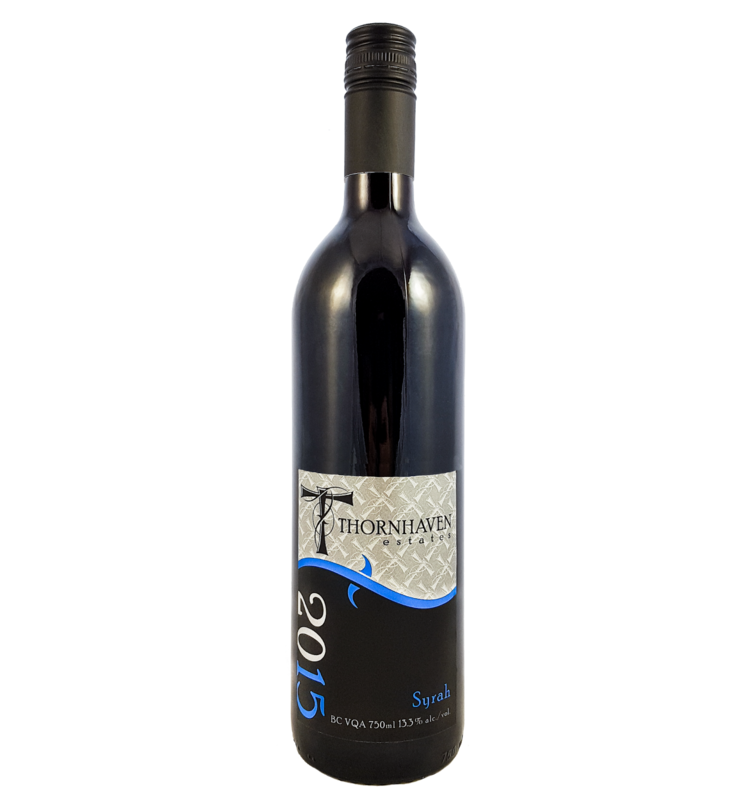 This wine has aromas and flavours of cassis, black cherry, dark chocolate and tobacco. Firm and rich in texture, this wine will blossom with another five years in the bottle. 91-93. This summer, Township 7 Vineyards made one of the most significant announcements in its history: it bought the 12-acre Blue Terrace Vineyard near Oliver. The vineyard, which was planted in 2000, has supplied Merlot, Cabernet Sauvignon and Sauvignon Blanc to Township 7 throughout the history of both the winery and the vineyard. That vineyard has become increasingly critical to Township 7 which has been expanding in recent years. Its prior vineyard holdings were small. Township 7’s modest vineyard holdings were a consequence of the winery’s history. It was established on a five-acre Langley vineyard where the original winery opened in 2001. The second winery opened in 2004, just outside Penticton, and has a postage stamp vineyard. For most of its history, Township 7 has relied on fruit from growers in the Okanagan. The increasing competition for grapes from growers threatened to cap the winery’s growth. Now, it has assured access to premium fruit from Blue Terrace. The winery founded by Gwen and Corey Coleman. In 2006, they sold the winery to former restaurateur Mike Raffan (and a partner). In 2014, the winery was acquired by Ge Song, a Beijing businessman, who has retained Mike as Township 7’s general manager. The year before, Township 7 had embarked on a rebranding program that included smart new labels and, more important, taking control over its distribution channels. “We identified that we needed to run this company to control what we can control,” Mike says. “We went on a mission of direct to consumer sales because we control our relationship with the consumer.” The portfolio now includes eight to 10 wines available just to members of Township 7’s wine club. The new owner not only endorsed the strategy. He has invested in an expansion which gives Township 7 a capacity of 12,000 cases. He also backed the recruitment in 2014 of winemaker Mary McDermott, who had been a senior winemaker making premium and sparkling wines in Ontario for Andrew Peller Ltd. She has had a profound impact on the quality of the wines. One reason has been the relationship she has cultivated with Township 7’s growers. She has also accelerated Township 7’s sparkling wine program, with at least two other bubblies soon to join Seven Stars, the winery’s original traditional method sparkling wine. This program also salvages the fruit from the Langley vineyard which, for several years, was relegated to an annual grape stomp. Here are notes on current releases from Township 7. 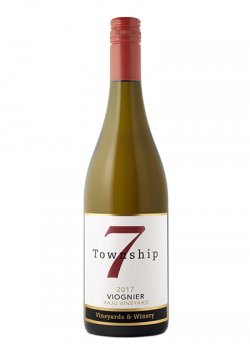 Township 7 Unoaked Chardonnay 2017 ($18.97 for 298 cases). Crisp and fresh, this wine has aromas and flavours of citrus and apple with a light herbal note. 90. Township 7 7 Blanc 2017 ($18.97 for 588 cases). This is a blend 50% Gewurztraminer, 28% Pinot Gris, 11% Viognier, 7% Riesling and 4% Muscat. The wine is refreshingly spicy. A touch of residual sugar supports the aromas and flavours of pear and apple. The finish lingers. 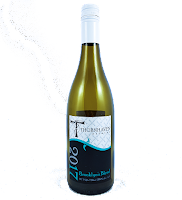 90.
l"> Township 7 Reserve Sauvignon Blanc Blue Terrace Vineyard 2017 ($26.97 for 348 cases). Fermented and aged seven months in barrel, this wine announces itself dramatically with aromas of lime, gooseberry and grapefruit with herbal notes. Those lead to intense flavours of tropical fruit, with a refreshing, tangy finish. 92. Township 7 Viognier Raju Vineyard 2017 ($24.97 for 498 cases). The Raju Vineyard is near Osoyoos. Some 30% of this wine was fermented with indigenous yeast in French oak barrels; the rest was fermented in stainless steel. Both the aromas and the flavours are intense, recalling peaches, apricots and passionfruit. The wine has good weight on the palate but the bright acidity maintains appealing freshness. 93. 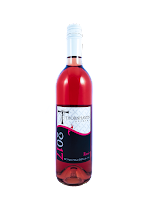 Township 7 Rosé 2017 ($18.97). This is a blend of 41% Cabernet Franc, 25% Merlot, 19% Pinot Noir, 8% Malbec and 7% Petit Verdot. The wine has an attractive salmon pink hue. It begins with aromas of strawberry and rhubarb, leading to a bowlful of fruit flavours on the palate. The finish is crisp and refreshing. 91. Township 7 Seven Stars 2015 ($29.97 for 533 six-bottle cases). Made with Chardonnay, this elegant traditional method sparking wine begins with a vigorous mousse. It has aromas and flavours of citrus and brioche. On the palate, the wine dances lightly and is refreshing on the finish. 92. 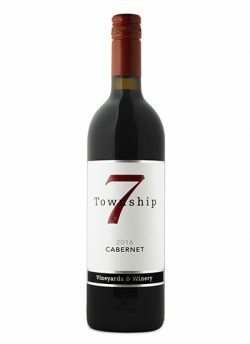 Township 7 Cabernet 2016 ($27.97 for 328 cases). This is a blend of 66% Cabernet Sauvignon and 34% Cabernet Franc. The wine begins with aromas of cassis, black cherry and mocha, echoed on the palate along with coffee and tobacco notes. Long, ripe tannins give the wine a generous texture. 91. 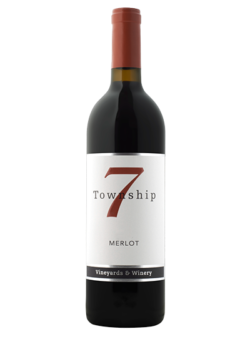 Township 7 Merlot 2016 ($24.97 for 1,038 cases). 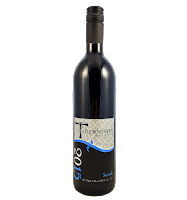 This wine is made with grapes from both Blue Terrace and the Front Yard Vineyard (which adjoins the Penticton winery). A portion of the wine was fermented in a 5,000-litre oak fermenter, an example of the new tools owner Ge Song has provided his winemaker. The wine is rich and concentrated, with aromas and flavours of black cherry, black currant and vanilla. 91. 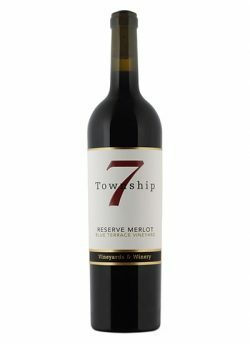 Township 7 Reserve Merlot Blue Terrace Vineyard 2015 ($39.97 for 125 cases). This terrific wine was available to the wine club only and now is sold out. It is a plush, satisfying wine, with aromas and flavours of black cherry, plum, black currant and vanilla. 92. With its fifth vintage of Chardonnay, tiny Coolshanagh Vineyard confirms it is one of the premier Chardonnay producers in the Okanagan. The release of 750 cases of the 2016 vintage is the largest release so far from this Naramata Bench producer. There will never be much because Coolshanagh has just 10 acres of vineyard, almost a quarter of which is more recently planted Pinot Noir. The first vintage of Pinot Noir was 2015 – a miniscule 27 cases. Production of that doubled in 2016. Coolshanagh is a boutique winery operated by Skip and Judy Stothert. The wines are available on the Coolshanagh website (and in some high-end restaurants). There is no tasting room of wine shop. The vineyard, seven kilometres north of Naramata Village, is at the north end of Naramata Road, just past the Chute Lake turnoff. The Stotherts bought the 52-acre property in 2003 because they wanted acreage with views of Okanagan Lake and also with privacy. There was no intention to plant vines initially. “We bought the property just to retire,” Skip says. Skip is a retired businessman. The company he founded is now called Green Roads Recycling. It is a road paving company with a difference: it renews paving with a moving train of equipment that scoops up the old pavement and melts it and mixes that with the new pavement that is laid down immediately. Trees were felled, land was prepared, and the first hectare of Chardonnay was planted in 2004. Since then, the vineyard has been quadrupled with the planting of more Chardonnay and Pinot Noir. For viticulture advice, Skip has tapped the experience of Okanagan Crush Pad vineyard managers as well as Pedro Parra, the Chilean terroir consultant used extensively by OCP. Between 2008 and 2011, Coolshanagh Chardonnay grapes were sold to Foxtrot Vineyards. Then in 2012, Skip and Judy decided to launch their own label. The target, when Coolshanagh is at full production, is to release about 1,500 cases of Chardonnay and 300 cases of Pinot Noir annually. The wines are made for Coolshanagh by OCP’s winemakers, with input from Skip, who has a clear idea of the style he wants for Coolshanagh. He does not want to make a California-style Chardonnay. He wants an age-worthy wine in the style of a white Burgundy. The 2016 Coolshanagh Chardonnay began by picking on advice from Pedro Parra. “Each block of Chardonnay is hand-picked at a different time, with the first picking taking place in mid-September and the last in early October, 2016,” according to the technical notes for the wine. “Each section was treated differently to optimally express each vineyard location.” The lots were ultimately blended and bottled without fining or filtration. A note on the winery name. Coolshanagh is a Celtic word that translates as “a meeting place of friends.” For the Stotherts, it had an excellent ring to it for their property. The name has been used by Judy’s family, which has roots in Scotland and Ireland, for several generations to identify their various homes. A note on the wine. Coolshanagh Chardonnay 2016 ($36.90). This elegant wine has aromas and flavours of citrus and apple with very subtle oak, bright acidity and a spine of minerality. The flavours are fresh and focused, supported with good texture. 93. Late this summer, Danny Evanishen, the veteran tasting room manager at Thornhaven Estates Winery in Summerland, offered to send a sample a sample of the winery’s platinum award Syrah 2015. I agreed but I also asked him to include a few other wines. Given the daunting number of wineries in the Okanagan, I had not been able to visit Thornhaven in some time. With its Santa Fe architecture, the Thornhaven winery is an Okanagan jewel. Tucked away behind Summerland’s Giant’s Head Mountain, the adobe-hued winery is at the top of a slope covered with about 3.2 hectares (8 acres) of vines. The patio affords postcard views, but the best view is from the bottom of the undulating vineyard, preferably when the late afternoon sun paints a golden tint on the winery and the hillside behind it. The vineyard was planted by Dennis Fraser, a former grain farmer from Dawson Creek who sold his farm, almost 1,000 hectares (2,500 acres), in 1989 and then began converting a Summerland orchard to vines (Pinot Noir, Chardonnay and Gewürztraminer, with a bit of Sauvignon Blanc and Pinot Meunier). Winemaking began here in 1999, with Fraser planning a modest tasting room in the basement of his home. Then, a farmer’s habit of thinking big took over and he built a picturesque winery. The winery was purchased in 2005 by Dennis’s cousin, Jack Fraser, who was changing careers after 24 years working in overseas oilfields (mostly in Libya). Thornhaven is now managed by Jack and his wife Jan, a lively tasting room personality. Son Jason, who mentored with consultant Christine Leroux, is the winemaker. In addition to the estate vineyard, Thornhaven gets grapes from another 10 acres of winery-owned Summerland area vineyards. The varietals even include Syrah, a grape not often found in the Summerland vineyards. Thornhaven must have a small block. The winery made just 90 cases of the award-winning 2015 wine. The wines are excellent. I continue to stand by my view that the Gewürztraminer is the flagship wine here. Thornhaven Gewürztraminer 2017 ($18). This delicious wine begins aromas of spice, rose petals and lychee, which are echoed on the palate, along with a touch of lime. A full-bodied wine, it is balanced toward dry with just enough residual sugar to give it a fleshy texture. 93. 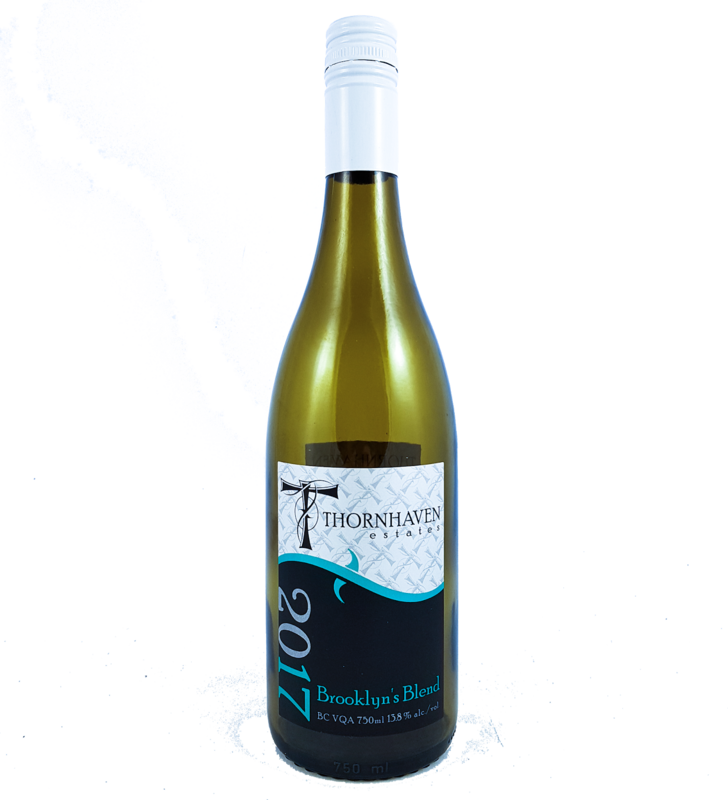 Thornhaven Brooklyn’s Blend 2017 ($16). This blend of Sauvignon Blanc and Chardonnay begins with aromas of melon and apple mingled with lime. On the palate, there are luscious tropical fruit flavours of mango, peach and pear. 90. 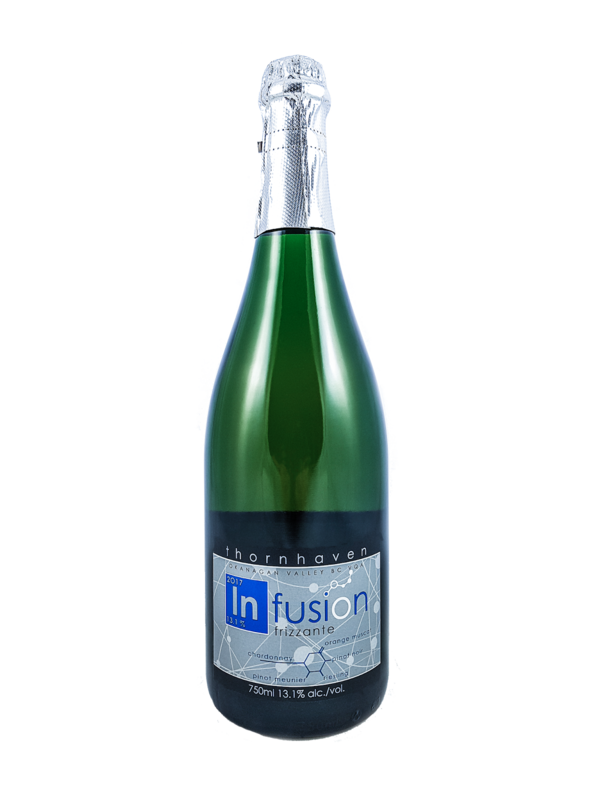 Thornhaven Infusion Frizzante 2017 ($N/A). 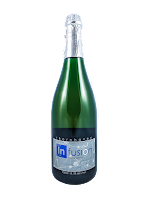 This sparkling wine is a blend of Chardonnay, Orange Muscat, Pinot Noir, Pinot Meunier and Riesling. It presents in the glass with a light blush hue and with a lively mousse. The aromatics are fruity and the flavours recall strawberry and ripe apple. 91. 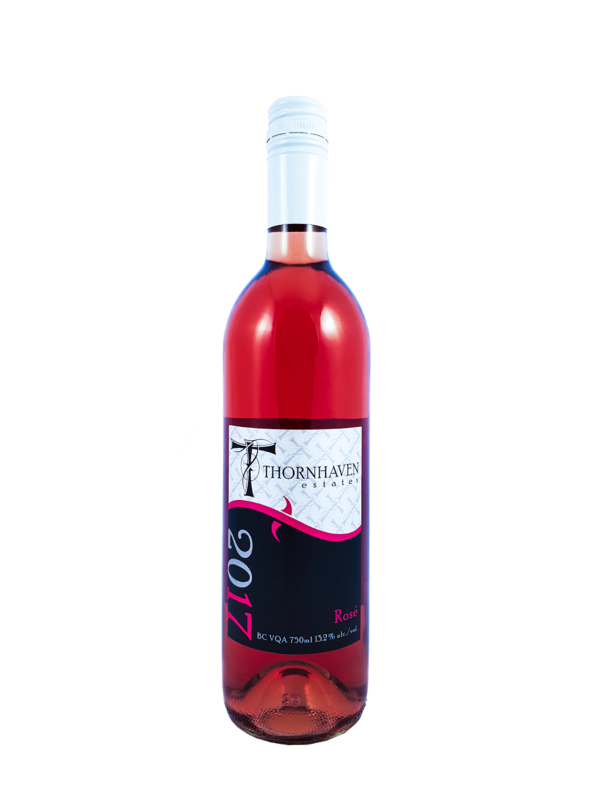 Thornhaven Rosé 2017 ($16). 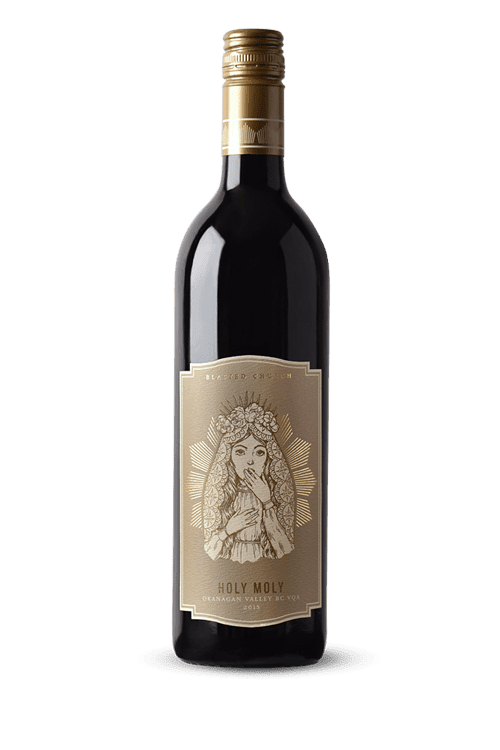 The winery describes this as a “robust patio wine.” Cherry-hued and rich on the palate, it has aromas and flavours of strawberry, cherry and raspberry. The wine is a blend of Pinot Noir, Pinot Meunier and Syrah. 90. 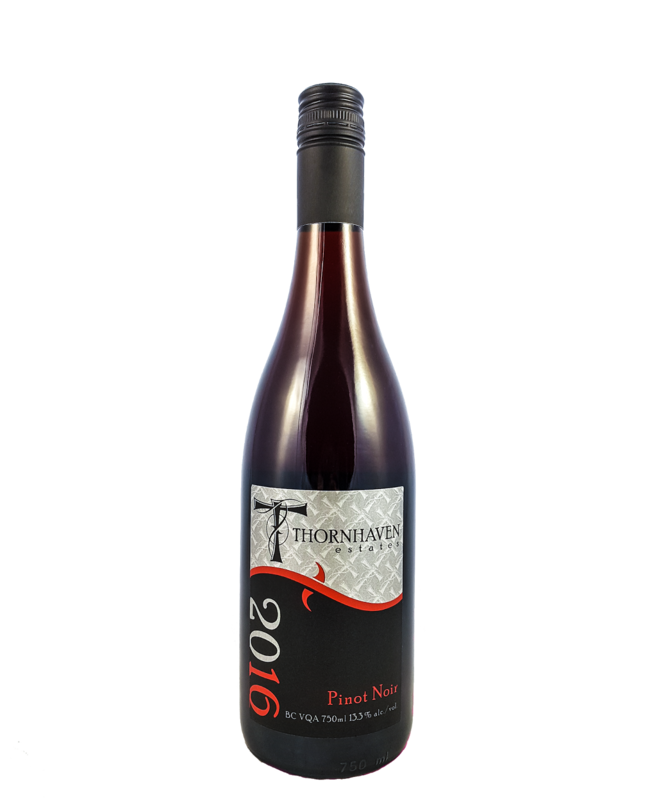 Thornhaven Pinot Noir 2016 ($19). This oak-aged wine begins with aromas of toasty oak mingled with cherry. On the palate, it has flavours of strawberry and cherry. The wine has a silky texture and a medium-bodied palate weight. 90. 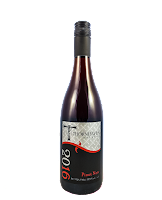 Thornhaven Syrah 2015 ($30). This elegant and medium-bodied wine begins with aromas of plum, black cherry and fig. 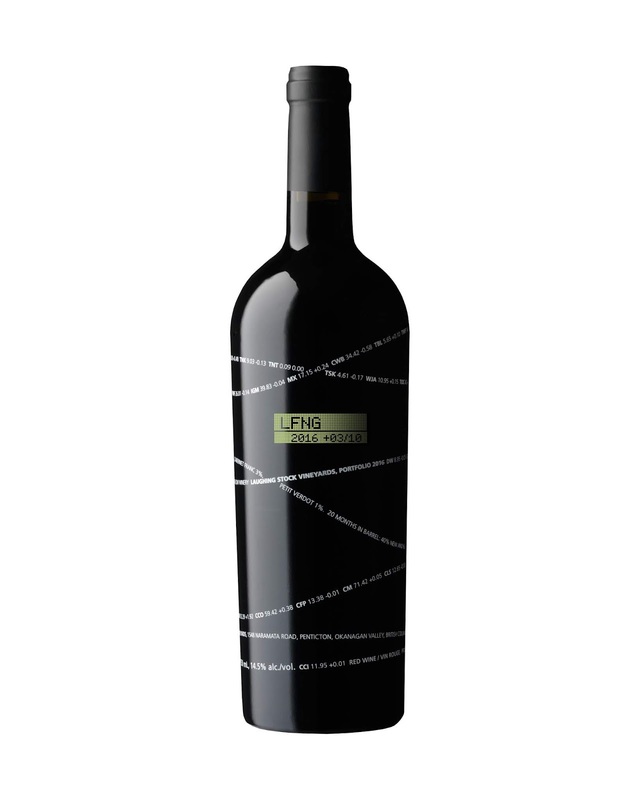 This is a dry wine with a palate of sweet fruit – cherry, blackberry, plum, a hint of licorice and pepper. 92.